Brutal is the word that best describes the 8 day training climb I spent last week in the Mt Cook National Park in New Zealand. Together with partner Alan Silva, we attempted to climb the full west ridge of Malte Brun, a 3200m peak opposite Mt Cook. On Saturday 5th February we took a helicopter flight into De le Beche hut, located on the true right moraine walls of the Tasman glacier. This saved a horrendous full day walk-in over the glacial moraine which coats the lower half the Tasman Glacier laden down with 8 days food and climbing gear. We banked on taking around 3 days to complete the climb from a base camp we would setup in the Beetham Valley at the base of the West Ridge. The west ridge is a long and winding and gradually becomes steeper and more exposed the higher you climb. From my research I felt it was well suited as a ‘training climb’ for my attempt on the North Ridge of Everest in April and May, and I was not to be disappointed. Typical New Zealand weather patterns saw a series of fronts passing through that kept us hut bound for the first three days. 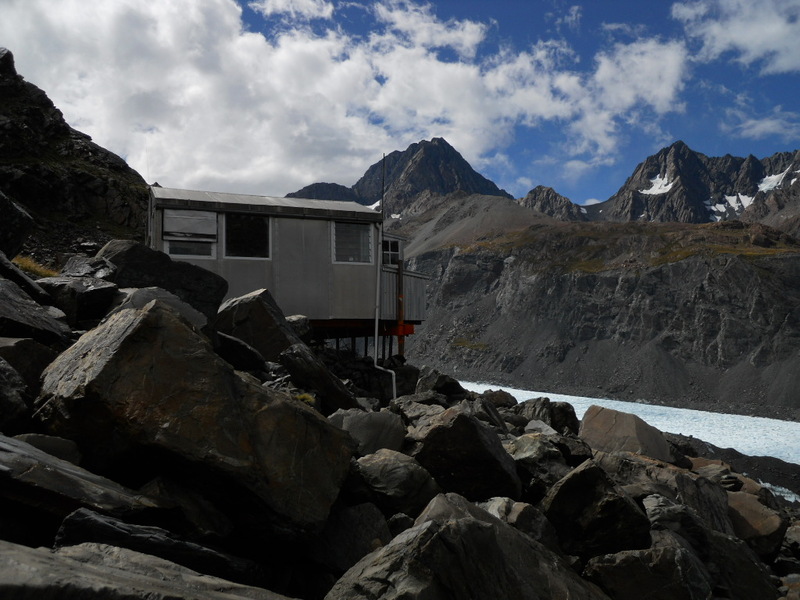 There is no cell phone reception in this area, only a DOC emergency radio in the hut, which the weather forecast is read out at 7PM in the daily radio schedule. We spent a pleasant and relaxing 3 days resting in the hut while rain and heavy wind blasted and shook the hut. During one of the short breaks in the weather, we went for a wander up the De le Beche ridge behind the hut, where to my horror, both soles of my boots started to disintegrate. After some scrambling around in the hut, a short length of wire was ‘located’. Under Mr ‘fix-anything-in-the-whole-world ’ Alan’s guidance, the wire was heated up over the MSR stove, pushed through the plastic mid sole of my boot and bent around underneath the rubber soles to hold them in place. I hoped the fix would last the remainder of the climb. By Tuesday we finally had the good news of a 3 day fine weather clearance and saddled up with all our gear and food and headed off to cross the Tasman glacier and into the lower Beetham valley where we would set-up our basecamp. 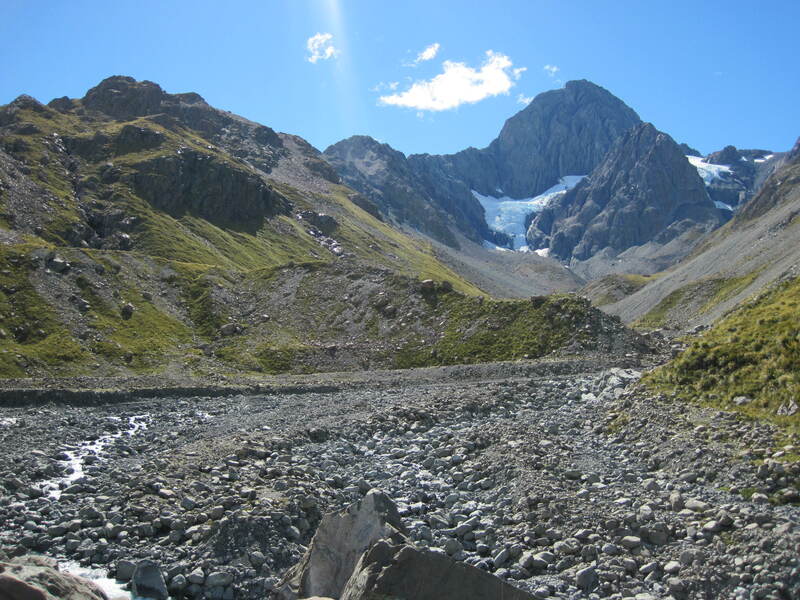 The Tasman glacier proved to be interesting to negotiate, with a series of pressure ridges and melt holes causing us to take a number of hours to negotiate before finally reaching the entrance to the Beetham valley. Some delicate front pointing around, up and over these pressure ridges provided the highlight of the day and it was not long before we arrived at the mouth of the Beetham stream. 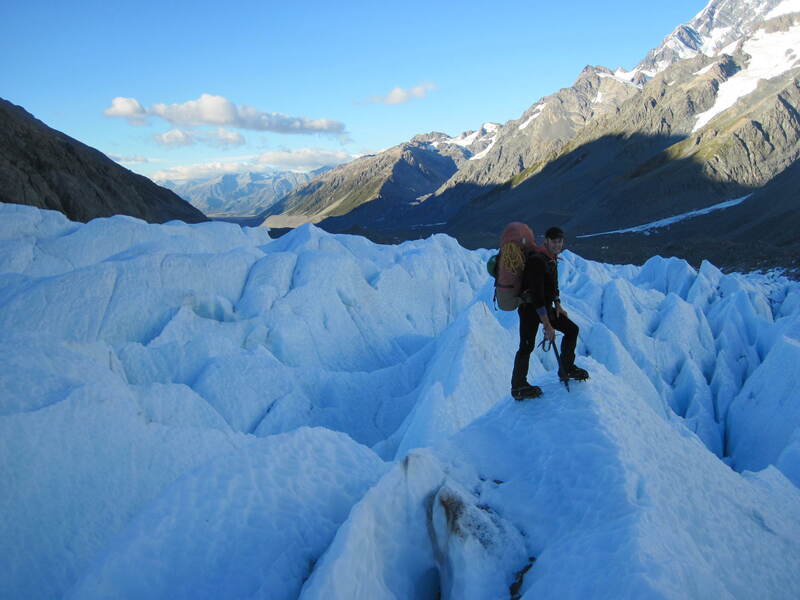 Tiptoeing around a large flake on the Tasman Glacier. Photo Alan Silva. To ascend into the Beetham valley, a 200m climb up either the true right or true left side of the Beetham stream is required. In years gone by, erosion has changed this from a gentle up-hill stroll, into a desperate, exposed, scree scramble. “Christ – I am scared shitless already and have not even begun the climb yet” I thought to myself as I clung to the hillside, staring down 50m into the Beetham stream thundering below my feet as I continually searched for something secure to hang onto. With a heavy pack on, this was hard work and with relief we finally popped out to see the pristine Beetham valley unfold before our eyes. View up the Beetham Valley from Basecamp, The West Ridge of Malte Brun on the left. 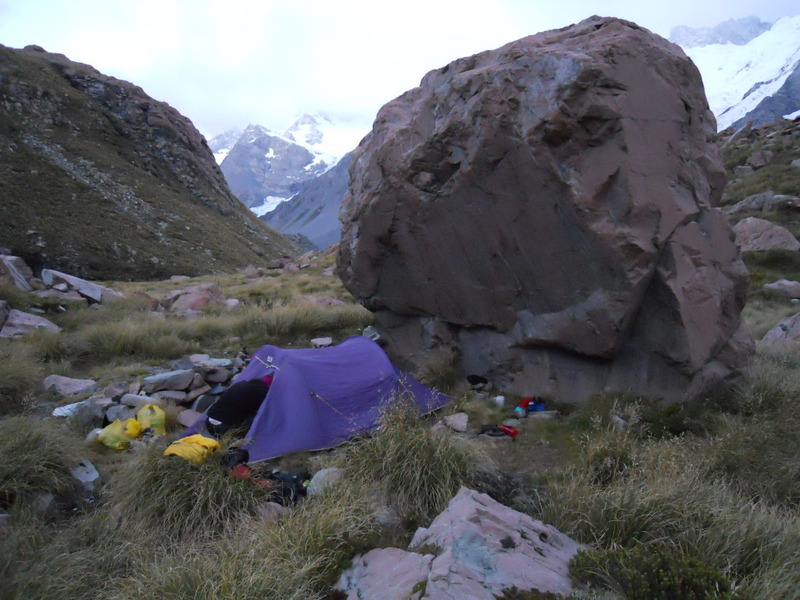 We chose our base camp site in the shelter of a large rock, gladly dropped our heavy packs and setup our tent. The west ridge of Malte Brun took central stage as we brewed tea and made a dinner of pasta, tomato, carrots, broccoli and tinned tuna. Rain that night forced us into the tent early, we slept well to wake up to a fine clear day on the Wednesday morning. Stripping down our gear as much as possible, we planned for a 2 night 3 day assault on the west Ridge from our base camp site. We left around 7AM and headed up to the base of the ridge. Water was always going to be an issue on the route, from base camp we thought we could identify two very small patches of snow high up on the ridge where the gradient steepens. From the map, I calculated we had 3.5km of horizontal distance and 1000m of vertical climbing to reach this site, where we would bivvy for the night. Basecamp on the Beetham Valley, Photo Alan Silva. The west ridge starts off tranquilly then rises in a series of steep rock steps. It gradually becomes narrower and more exposed the higher we climbed and everywhere there was loose rock. In fact the higher we climbed the more loose the rock became. 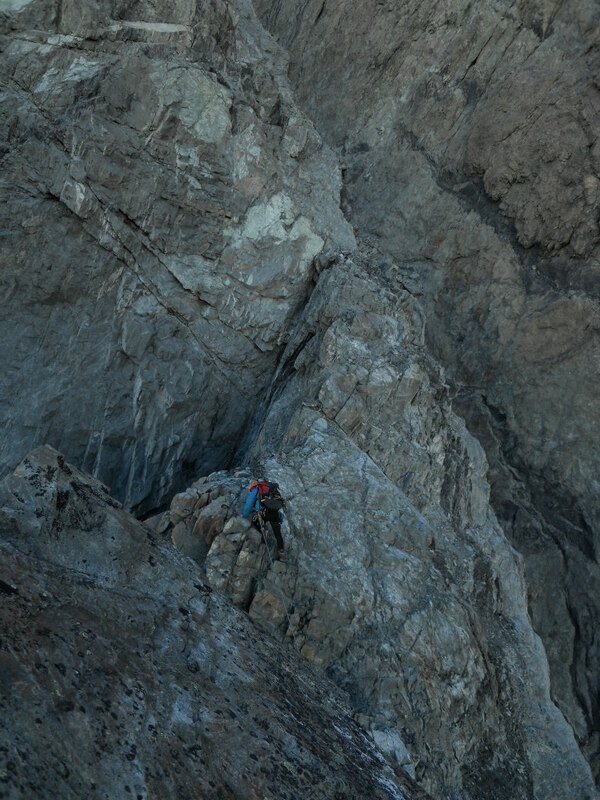 We ground our way up the ridge, sidling around some rock steps or gendarmes, and scrambling up steeper pitches which eventually we roped up and simul-climbed. A rock with a natural bowl indentation in the top held some precious drinking water which we gladly sucked up with a drinking straw that Alan had thoughtfully bought with him. On this ridge any water you find is a bonus. Photo Alan Silva. Higher and higher we climbed over increasingly steeper and loose rock until finally, 9 hours later we topped out over the last crest to see two glorious patches of snow, about the size of half a tennis court each, lying glinting in the late afternoon sun. The bivvy site was soon set-up and snow melting started on the MSR stove. I quietly sat soaking in the magnificent vista which unfolded before my eyes. The Tasman Glacier in all its beautiful icy white glory, the mountains of the main divide – Mt Cook, Mt Tasman, Mt Green, Ellie de Beaumont, Hochstetter Dome, many of which I have climbed on in the past. Helicopters occasionally buzzed past at our level and I could not help thinking how the people in them would be safely back in their comfortable homes within 30 minutes to an hour. Staring at the steep rock buttress which we would be negotiating in the morning, my stomach tightened and I kissed my wedding ring tied around my neck. I just hoped the rock would be in better condition higher up on that steeper ground than we had seen so far. Its bedtime at the bivvy Site. Alan Silva about to hit the hay. The view from the Bivvy SIte. Sunset over Aoraki/Mt Cook the prominent peak on the left of photo. The next morning we had to force ourselves out of our bivvy sacks. It was below freezing during the night, and it felt hard to get moving in the cold before the sun finally hit us with is precious warm glow. A quick breakfast of porridge and tea, more snow melting to fill our 1 litre drinking bottles each then we were away. The first key to unlock, was to get over a very exposed col, between the flat area of the ridge we bivvied on and the steep 200m Buttress directly behind the bivvy site. This involved a hairy scramble across very loose rock, where everything we touched seemed to fall off and drop away underneath our feet. Great care was taken as I traversed across to the other side and setup a belay. Alan soon joined me and had to answer a call of nature, before taking over the lead and heading up the left hand side of the buttress. Just about across the dicey traverse – we nicknamed this the ‘chossalata’ – a play on the word ‘canalatta’ a famous loose section on Aconcagua.Photo Alan Silva. The climbing was not difficult, however was quite sustained and exposed and everywhere the rock moved or broke off at our touch. 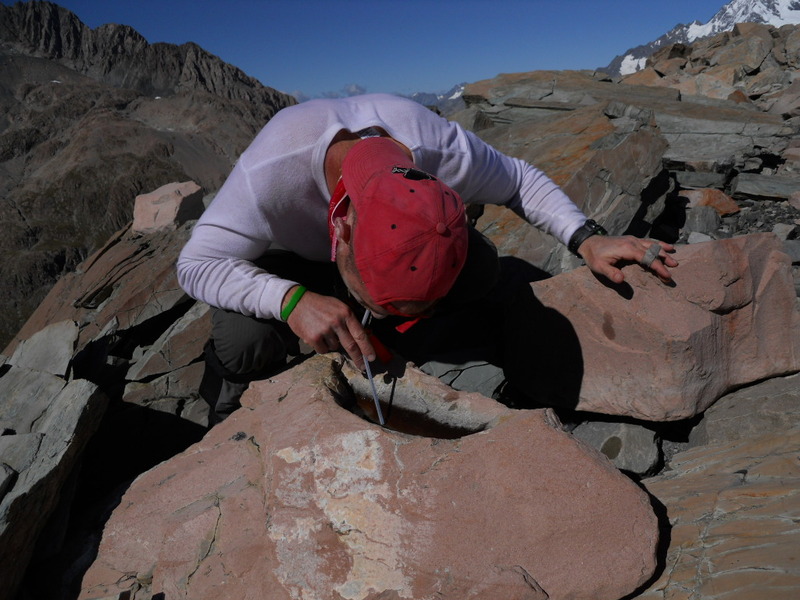 Every handhold and foot hold had to be tested before weighting it and getting any form of adequate protection into the rock proved tricky. We pitched the first few hundred metres of the climb, which turned out to be slow going. Before lunchtime, we changed back to simul-climbing and managed to make up some lost time. Around 1:00PM we topped out over the rock buttress to where the angle of the ridge eased off somewhat, The exposure started to increase dramatically and we carefully worked our way along the ridge, all the while being very careful what we held or stepped on. Loose rock dominated the show! Around 3:30PM we reached 2950m. Over the last 8.5 hours we had drank around half our water each (0.5 litre). We were still around 2 -3 hours to the summit, and looking back down the ridge, I knew it would be just as slow on the descent as it would be on the ascent. 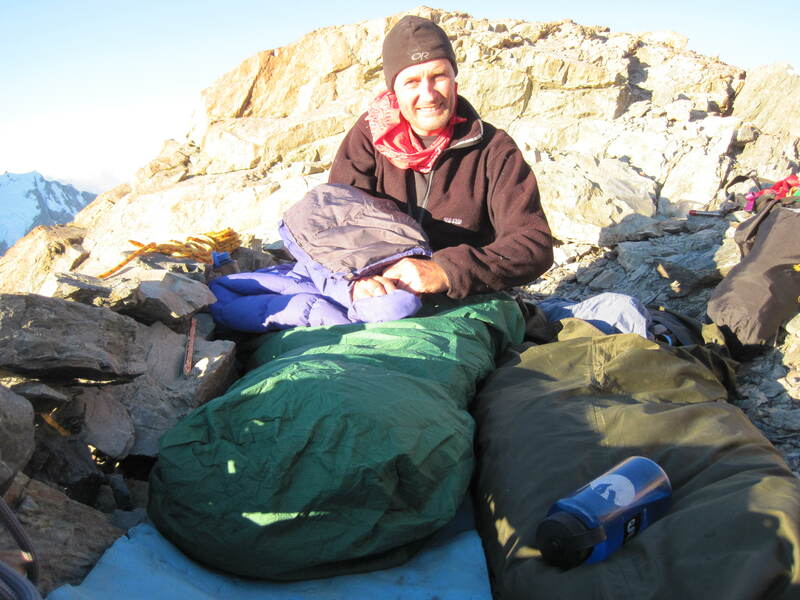 Neither of us had bought a head torch, (Alan’s had broken and I had left mine at the bivvy site), there was no water on the ridge and I did not relish the prospect of spending a night high up on the ridge without water. Alan, I feel would have been happy to continue however thankfully for me, he quietly agreed to turn around and begin our descent. 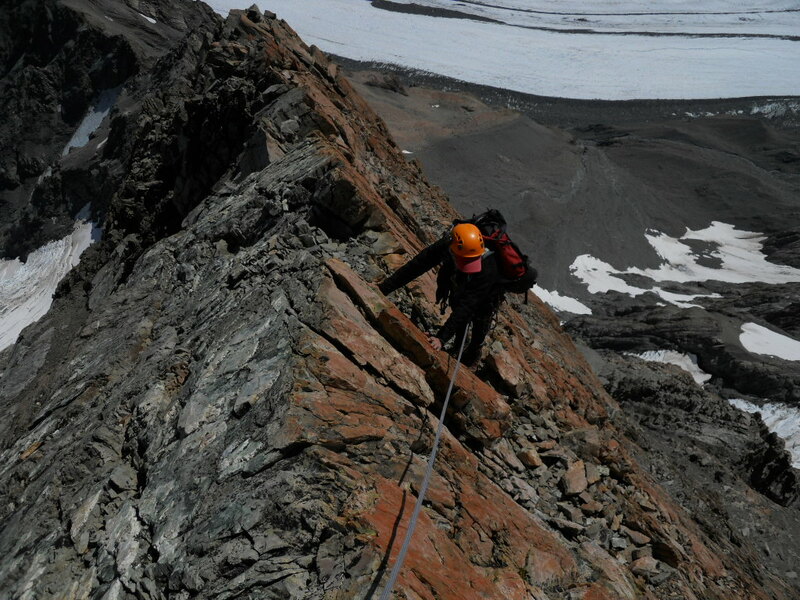 Climbing loose rock at 2900m on Malte Bruns West Ridge. Photo Alan Silva. The descent turned out to be just as slow as the climb, we down climbed as much as possible before it became steeper then started long 50m abseils with our two ropes. Abseil after abseil bought us down to a point 100m above the dangerously loose col that I had not enjoyed traversing over first thing that morning. By now it was pitch dark. We set-up the remaining two abseils down a steep gully to the base of the col. After the second to last abseil, Alan managed to find a chockstone wedged into the gully which we setup an anchor, and I made the last abseil down to where I almost reached the base of the col. I was still however stuck in the narrow gully, which was about 1.5m wide. Completely in the dark I felt around to find a crack which I slotted a cam into and tied myself into then shouted ‘rope free’ to signal to Alan to begin his descent. All day we had been knocking rocks down on each other as we climbed, it was impossible not to, the ridge was so loose. On Alan’s abseil he somehow managed to let go a very large one which he estimates as being around 20kg. He saw a shower of sparks as the rock began its plunge down the gully in the dark and screamed ‘rock’ to let me know I had a present coming in my direction. He did not need to shout this out as I could head the crashing and knew something big was coming. With nowhere to move in the gully I closed my eyes and hugged the wall of the gully as tight as I could. With a huge crash the rock just missed my head and slammed into the opposite wall of the gully before bouncing off and slamming into my leg almost knocking me over. I let out a small ‘arghh’ as I heard the rock continue to bounce down and finally explode onto the ice of the glacier 300m below my feet. Thankfully some minor bruising and some frayed nerves was the extent of the damage. Alan came down to my position, and we then started to discuss how we could get back over the col, on the tricky, loose, exposed traverse, in the dark. ‘I think you should lead it Grant – it will be character building’, said Alan. These were words I did not want to hear and after whining away for a couple of breaths I knew he would not relent so off I set. I had a tiny LED light around my neck which I held in my mouth in an attempt to see anything at all on the way over. 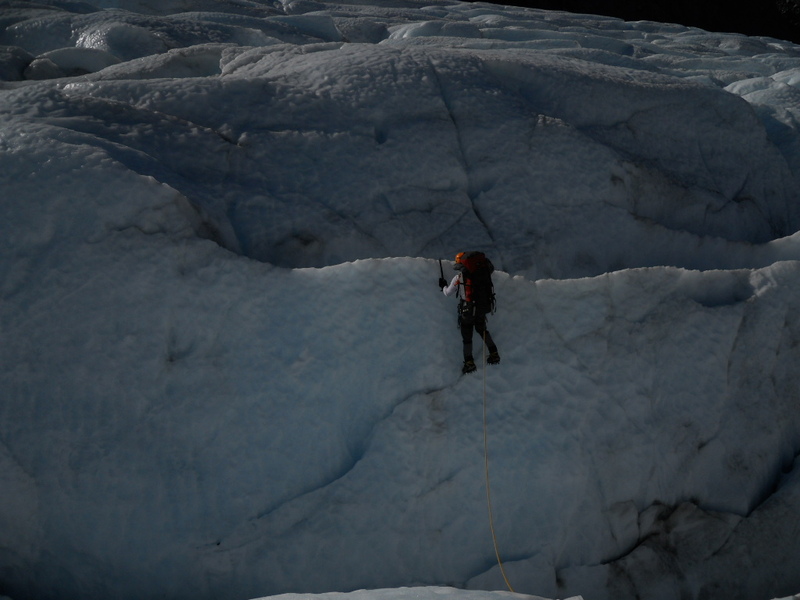 The next 30 minutes were completely terrifying for me, everything I touched move and fell away under my hands or feet to land 300m below on the ice of the Malte Brun Glacier. 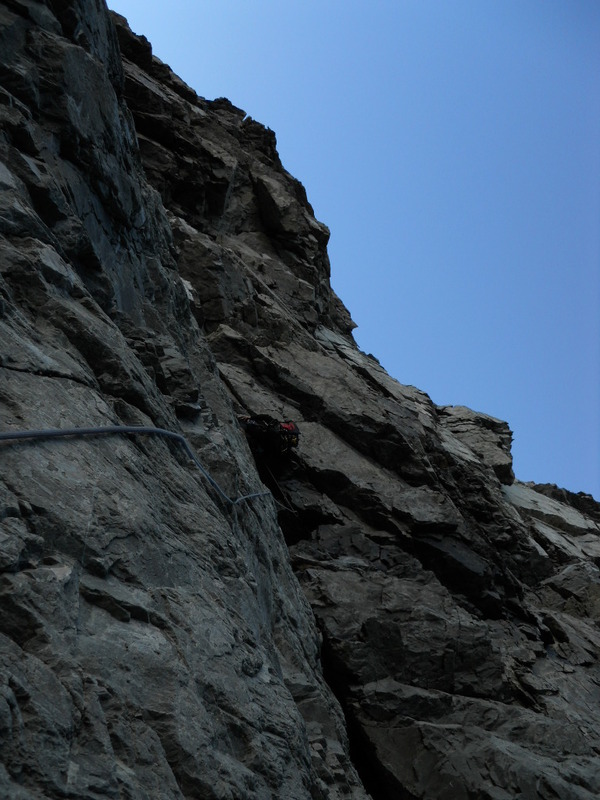 I finally reached the other side and with shaking hands set-up a rock solid belay to bring Alan over in the dark. Now it was Alan’s turn and without any light at all he made his way very carefully across. All I could hear was the sound of rocks falling and smashing into the ice below as he ‘climbed by brail’, using his sense of touch to get him across. It was a magnificent effort. We were now only 50m away from our bivvy with one more exposed patch to traverse to get back. My nerves were pretty shot by now and I was contemplating tying in and sitting out the night at my belay station. Alan took the LED light and lead the last pitch and agreed to my suggestion to leave the rope fixed on this last section. He then climbed back with the torch and assisted me with some light to make the final moves to get back onto safe ground. It was during this last pitch of climbing I heard Alan shout out ‘F#$%’ from the darkness. Normally quietly spoken I knew something serious was up and enquired what the issue was. He told me he would tell me once I reached safe ground. When I finally made it over, he showed me the issue of his concern, our rope had almost been severed in two by the large rock that had just missed wiping me out. We had not seen it in the dark and had climbed the last two pitches, in complete darkness with a severely weakened rope. Lady luck was on our side and we were fortunate that neither of us had a fall and needed to weight the rope. At 12PM we finally arrived back to our bivvy site, 17 hours on the move and I was a very relieved man. We brewed up for 2 hours and made some 2 min noodles for dinner before jumping into the sleeping bags at 2AM for 5 hours of well earned sleep. 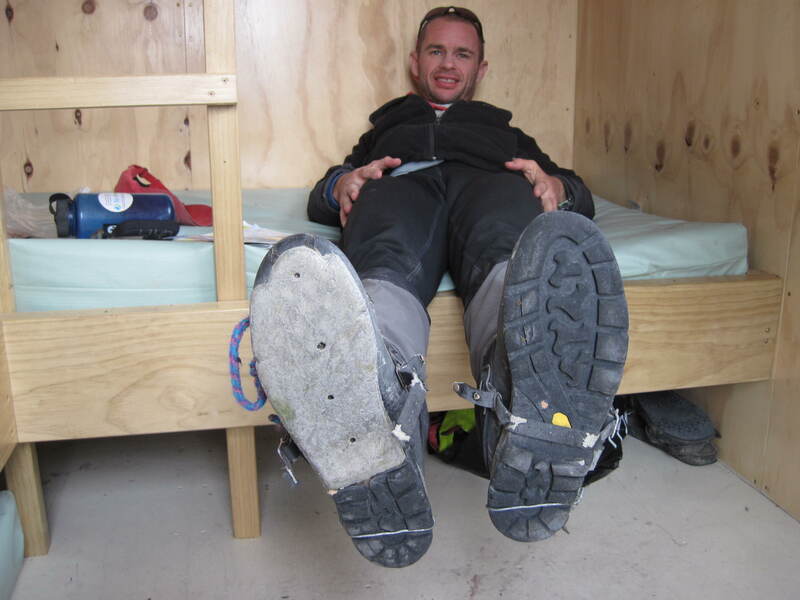 The following morning when we awoke, I noticed the whole front of my boot sole had fallen off. Some attempts to tie it on with cord all lasted less than 5 minutes and I soon just ripped the whole thing off and had to deal with a very slippery plastic boot sole for the remaining 3 days. That day it took us 9 hours to descend the ridge back down to our base camp. Lots of abseils and down climbing on more loose rock with only one litre of water was really hard work. I was so thirsty it was driving me crazy and my tongue was starting to swell up. Every time we stopped Alan would put his head down and close his eyes. It was two exhausted and thirsty climbers who stumbled into basecamp that evening. By this stage it was Friday, I had flights to catch on the Saturday morning from Christchurch to New Plymouth where my mother was to pick me up from the airport. I knew I would be missing these flights and that there would start to be some worried people. We woke on Saturday morning to an overcast windy day. As we broke camp I am could not stop thinking about what the descent would be like down the Beetham stream to get back onto the Tasman glacier. This had caused a few heart stopping issues on the way up and I knew it would be worse on the way down. 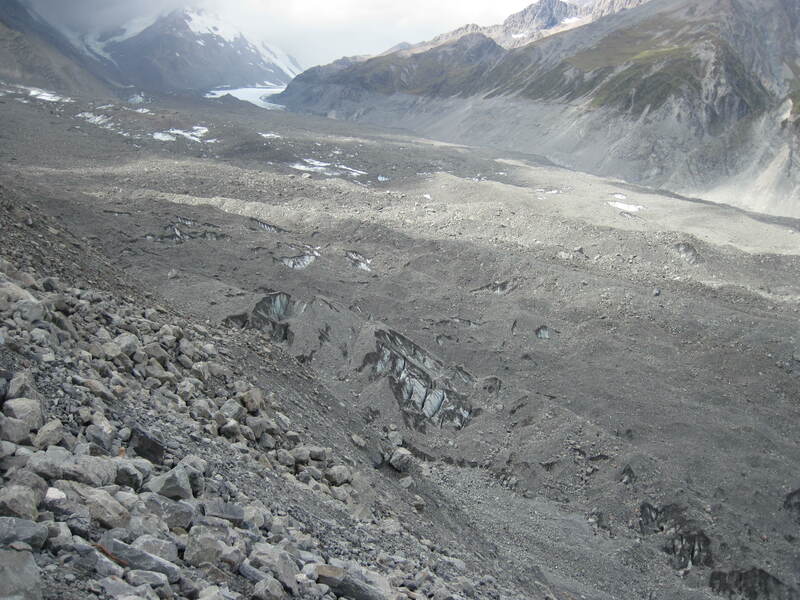 It was not to disappoint me and for 2 hours we carefully scrambled around the steep scree slopes until we finally could lose enough height to make the safety of the Tasman glacier. With my right boot having practically no grip with the lost sole, and with the weight of my pack threatening to overbalance me, I pretty much hated the entire experience. In hindsight it may have been better to ascend and descend the true left bank of the Beetham stream. My boots at the end of the trip. 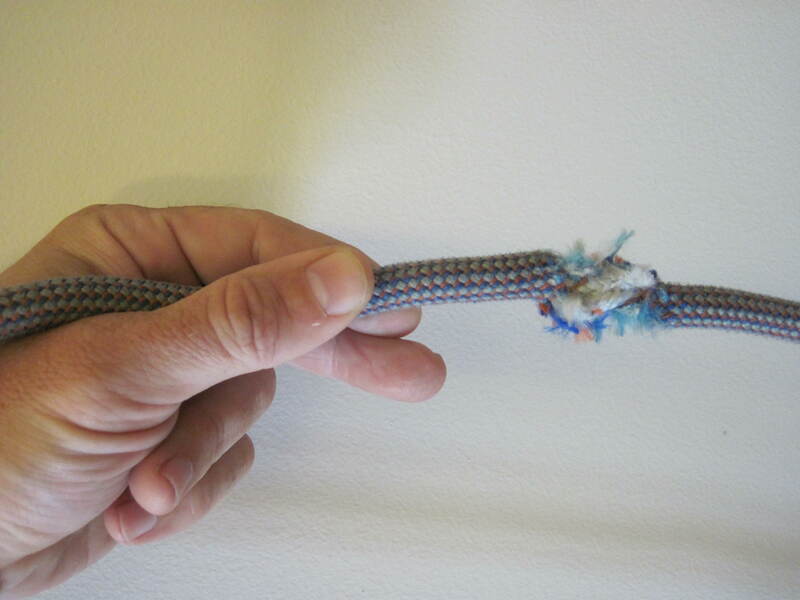 The back half of the sole is held on by wire. the front half of the right boot is missing. Wind now barrelled down the Tasman glacier as we began a torturous 9 hour trek back over the ice, then onto the moraine which covers the entire surface of the lower Tasman. This makes walking very difficult. Every footstep you take the rocks move and you are constantly stumbling and sliding. Coupled with the large gusts of wind at our back we staggered along like two drunk men until we finally reached garbage gully, the site where we ascend the true right wall of the lateral moraine onto a formed foot track leading to the Ball Shelter. I had heard terrible things about getting up garbage gully and how dicey it can be, however after the Beetham Valley entrance it was like a stroll down Orchard Road. We arrived at Ball Shelter around 5PM, and managed to place a radio call through to DOC, who kindly called my mother to let her know I was safe and we were slightly delayed on the way out. Gratefully we cooked dinner in Ball Shelter and curled up for a comfortable night’s sleep as the rain and wind beat down on the roof of the small cosy hut. The following morning we had a quick 2 hour romp to the end of the road where I hitchhiked the remaining 12km to Mt Cook Airport to pick up the car. It was wonderful to be out and finally make contact with Stephanie again and let her know all was safe even though we were two days late. My mother on not seeing me at the New Plymouth airport had naturally been concerned and called the Police so it would not have been long before a search operation had got in place. The view back up the Tasman from Garbage gully. We had come from the point in the top right corner where the ice begins in a brutal 9 hour slog. Over all a gruelling trip, I lost 2kg over the 8 days, Alan lost 5kg. On hindsight, next time I will bring a satellite telephone with me on trips like these. I would also look at entering the Beetham valley via the true left bank instead of the right, and would stay away from the lower section of the west ridge of Malte. It was a great training climb though, a real slap in the face and a welcome back to being on steep exposed terrain for long periods and it will put me in good shapes foe Everest. I was happy with my fitness levels, physically I lasted the distance well and still had gas in the tank even after 17 hours on our summit attempt. I did suffer from the lack of water, so as always need to watch my hydration. Alan and I are already discussing our return to Malte to complete some unfinished business with this mountain! Posted on February 20, 2011, in Everest 2011. Bookmark the permalink. 21 Comments. Hi Nina, thanks for the message. Yes next time I return will attempt the ridge from much higher up also. And also leave out the Beetham valley and the awful scree scramble. 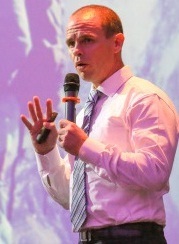 I hope to return in February 2012 – hope the NZ weather settles down and stops raining soon! Happy New Year! Ok well my friend can probably advise you if you want. He just climbed it last week and can let you know about the current conditions. I also want to climb it myself but I am freaked out by the exposure on the morraine and chossy rock. Was much easier when Frada Fu Faur first did it..!! Hi Nina, thanks for that – I will drop Kevin an email. I am not familiar with the POLLUX or Wilkin area. if it was on rock then I can assume it was the normal choss pile the Southern Alps is famous for! I was pretty amazed at the description in the guide book to the West Ridge of Malte as being some of the finest rock in NZ, very different to the reality! I have another friend who did a traverse (and came down the N West Ridge). If you send me your emal I will email you the link to his photo journey on flickr: He did it December 2 yrs ago. Would love to see the photo’s! Omg, classic, you know Max Gough also, I attempted Mt Aspiring with him back in 2007, might see him in Wlgtn soon also in Feb, I met him Unwin the day before his Malte climb, I had just climbed Mt Cook and he was about to head into Malte. Small world! Your fund raising an inspiration.. I see you stopped contributing to Greg Mortenson .. after the scandal..? For sure Nina. its not 100% confirmed I will be back yet, but am hopeful and will drop you a line if I do! Your friend Kevin made contact so thanks for passing on his details! 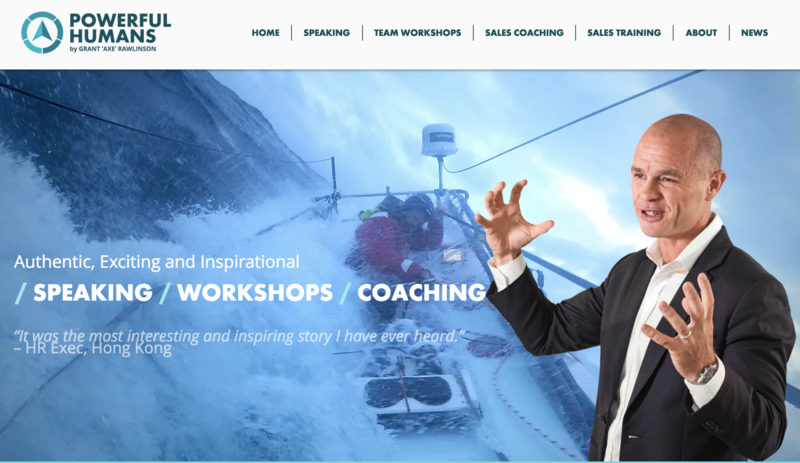 Sorry – saw your comment on the CAI – yes I stopped raising money for the CAI, I actually received news of the issues while I was on Everest. It’s difficult to know exactly what the truth is, I have heard both sides of the story and would take a guess the truth lies somewhere in the middle. The world of Charity and Non-profits is a potential minefield, which is from my experience last year! Unfortunate but true. I read “Three Cups of tea” in Colin Todd Hut on my first Aspiring Attempt and was captivated so devastated to hear all may not be what it seems…. Sure Nina, will let you know if I am coming over. 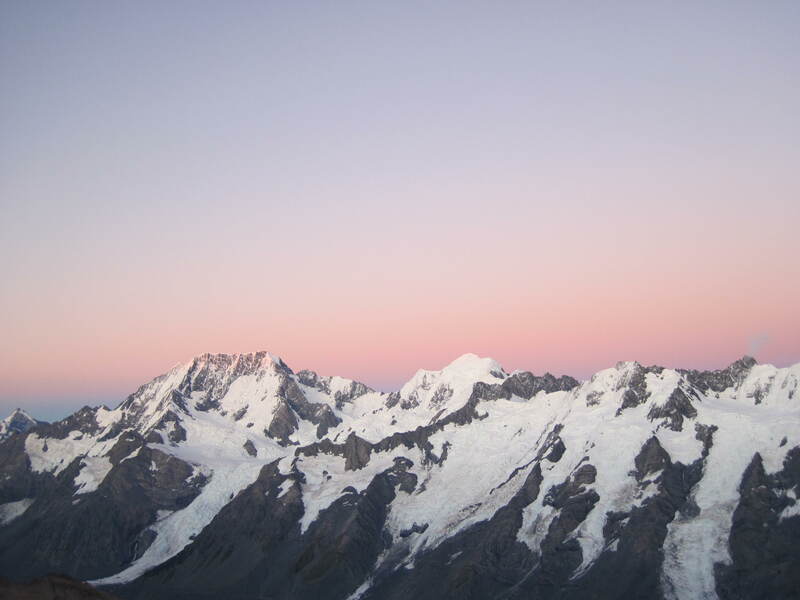 What route on Mt Cook are you looking at? If its the Linda then check out my page on my Cook climb. It has a really good topo sketch of the route and anchors up the summit rocks. Ok i found it.. it is getting to be a climb to do earlier and earlier in the season now…thnks..
Good luck on Cook – its a looong day so get fit! Yup, def decided to do Cook in Nov and started those ghastly runs.. don’t know if I have the exposure nerve yet for Zubriggens ridge but it is all in all probable safer than the Linda…ah well plenty of time to mull it over..